As Canadians head to the polls for a historically close federal election, a new survey finds that people in Canada are generally satisfied with their country’s current relationship with the United States. More than half (54%) say that Canada should remain about as close to the U.S. as it has been in recent years, with another 27% saying Canada should be even closer and only 16% saying they should be less close. Furthermore, 68% of Canadians have a favorable view of their southern neighbor, a figure that has stayed fairly consistent since President Barack Obama took office in 2009. About three-quarters (76%) have confidence in the U.S. president. But on the contentious issue of the Keystone XL pipeline, which is under ongoing U.S. State Department review, there are differences within Canada as well as between Canadians and Americans. Almost half of Canadians (48%) oppose building the pipeline, while only 42% favor it. In the U.S., however, almost six-in-ten (59%) approve of the pipeline, according to a November 2014 Pew Research Center poll. Within Canada, the greatest backing for the pipeline comes from those who support the incumbent Conservative Party (72%) and in Alberta (65%), where the energy sector accounts for 22% of the province’s gross domestic product and the oil sands region in question is located. On trade, Canadians and Americans show similar support for the Trans-Pacific Partnership (TPP) – 52% and 49%, respectively, say it is a good thing for their countries. About three-in-ten in each country say TPP is a bad thing, with the rest undecided. Just this week, the U.S. and 11 other Pacific Rim nations, including Canada, agreed to the deal at a meeting in Atlanta. Canada’s second-largest trading partner after the U.S. is China, but between the two, Canadians overwhelmingly favor the U.S. Only 39% of Canadians have a favorable view of China, and 73% say it is more important to have stronger ties with the U.S. than with China. In addition, an overwhelming majority in Canada says that China does not respect the personal freedoms of its people (86%), while 54% say the U.S. does respect human rights. Despite these findings, more Canadians think that China, not the U.S., is the world’s leading economic power, and many say China will either eventually replace the U.S. as the world’s leading superpower or has already done so. When thinking about international threats, Canadians are most concerned about the militant group ISIS, but also express concern about global climate change and Iran’s nuclear program. These are among the main findings of a Pew Research Center survey conducted among a nationally representative sample of 1,004 Canadians reached by telephone from May 4 to 15, 2015. Majority of Canadians Have a Positive View of the U.S.
By a healthy margin, people in Canada have a positive view of the U.S. Roughly seven-in-ten Canadians (68%) view their neighbor favorably, while 26% hold an unfavorable opinion. Over time, sentiments toward the U.S. among Canadians have held fairly steady, although favorability dipped after the start of the Iraq War in 2003 and hit a low of 55% in 2007. However, even from 2003 through 2008, an era of low international opinion of the U.S., most Canadians held a favorable view of their southern neighbor. 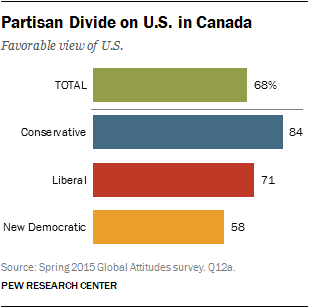 There is a sharp partisan divide when it comes to Canadians’ opinions of the U.S. Followers of the incumbent Conservative Party of Canada (CPC), led by current Prime Minister Stephen Harper, have the most positive views of the U.S. (84%). Among those who support the Liberal Party, 71% give the U.S. a thumbs-up. But among backers of the social-democratic New Democratic Party (NDP), only 58% have a favorable view of America. Despite these differences, majorities of all political stripes in Canada still have a favorable view of the U.S. Among the other countries and institutions tested, the most admired is the North Atlantic Treaty Organization (NATO). A 56% majority have a favorable view of the organization. Fewer Canadians have a positive opinion of other countries tested, including only 39% with a favorable view of China. Even fewer have positive views of Russia (26%) and Iran (16%). About three-quarters of Canadians (76%) have confidence in President Obama to handle international affairs, versus only 23% who express little or no confidence. This majority is less overwhelming than in 2009, however, when nearly nine-in-ten Canadians (88%) had confidence in him. In the current survey, women (82%) are more likely than men (69%) to express confidence in Obama. Most in Canada Prefer Current Relationship with U.S. When asked about the U.S.-Canada relationship, more than half of Canadians (54%) say they want to remain about as close to the U.S. as they have been in recent years. Around a quarter (27%) say they want to be closer to their more populous neighbor, while only 16% express a desire to be less close. CPC and Liberal supporters are also more likely to want closer ties with the U.S. (40% and 35%, respectively), compared with NDP supporters (16%). Overall, 42% of Canadians favor building the Keystone XL pipeline, which would run from Canada’s oil sands region in Alberta through the American Midwest. Nearly half (48%) oppose the project. Comparatively, as of November 2014, 59% of Americans favored the pipeline, with only 31% opposed. Despite a mixed assessment of the Keystone project among the entire Canadian populace, there are significant demographic differences within the country. There is also greater support for the pipeline among high-income Canadians (making over 100,000 Canadian dollars per year), those ages 50 and older, men, those with a high school education or less and English speakers. Just about half in Canada (52%) support TPP. Roughly three-in-ten (31%) say the agreement would be a bad thing for Canada. There is similar support in the U.S. for the deal – 49% say it is a good thing, while 29% believe it is bad for America. CPC supporters are the most favorable toward the free-trade agreement, with 70% saying it is a good thing for their country. Liberals also support the deal. However, only 42% among NDP supporters think TPP is a good thing for Canada, while a nearly equal 45% say it is a bad thing. The NDP’s leader, Tom Mulcair, has expressed skepticism of the huge, U.S.-led trade deal. There are also regional divides in the TPP issue. Albertans (60% good thing) are more inclined toward the deal than Ontarians (47%) and British Columbians (44%). Additionally, men express greater support for the free-trade agreement compared with women. The U.S. is by far Canada’s largest trading partner, accounting for $707 billion in goods and private services trade between the two countries in 2012. When asked whether it is more important to have strong economic ties with China or the U.S., 73% of Canadians choose the U.S. Only 13% would favor stronger economic ties with China. Despite these sentiments, Canadians tend to believe that China, and not the U.S., is the world’s leading economic power. A 46% plurality of Canadians say that China is the top economy, while just 34% name the U.S. French-speaking Canadians (58%) and followers of the NDP (57%) are more likely to name China as the world’s leading economy, compared with English speakers (43%) and both Liberals (44%) and CPC supporters (40%). 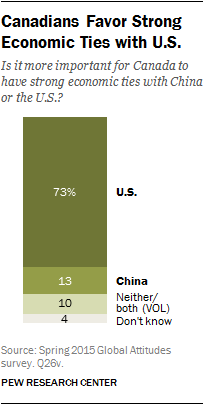 Similarly, 52% of Canadians say China will replace or already has replaced the U.S. as the world’s leading superpower. Only 40% say China will never replace the U.S. Canadians ages 18 to 29 (65%) are much more likely to say China will replace the U.S. or already has than those ages 50 and older (46%). Additionally, more educated Canadians, those who speak French and NDP supporters are more likely to say that China will surpass or already has surpassed the U.S. as the top world power. In the realm of human rights, Canadians clearly prefer the U.S. over China. More than half of Canadians (54%) say the U.S. government respects the personal freedoms of its people, compared with only 5% who say the same about China. Despite this, there has been a significant decline in Canadians’ views of America’s commitment to human rights in the past two years. In 2013, fully 75% in Canada said the U.S. government respected its own people’s rights. Canadians making more than CA$100,000 are more likely to say the U.S. respects personal freedoms (61%) compared with Canadians who make less than CA$50,000 (46%). CPC backers (70%) are also more likely to say the U.S. government respects human rights compared with Liberals (59%) and NDP supporters (42%). Across the threats tested, there are substantial differences on acute concern by gender, age and party. On four of the international issues, women are significantly more concerned than men. This includes two-thirds of women who are very concerned about ISIS, compared with only 49% of men. Older Canadians (those ages 50 and older) are particularly worried about most of these international threats. Fully 72% are very concerned about the ISIS threat, compared with only 42% of Canadians 18 to 29 years old. Older Canadians are also more concerned about Iran’s nuclear program, cyberattacks, tensions with Russia and territorial disputes with China compared with younger Canadians. There are also significant partisan differences on the international threats tested. CPC supporters are more concerned about ISIS (74% very concerned) and Iran’s nuclear program (61%) compared with both Liberal and NDP supporters. Both Conservatives and Liberals are also more concerned about cyberattacks and tensions with Russia compared with Canadians who support the NDP. However, NDP supporters are much more concerned about the threat of global climate change (60% very concerned) compared with Liberals (48%) and especially CPC backers (27%).